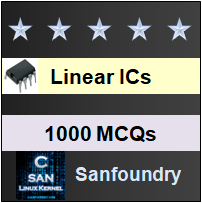 This set of Linear Integrated Circuit Multiple Choice Questions & Answers (MCQs) focuses on “Instrumentation Amplifier – 1”. 1. Strain gage is an example of which device? Explanation: Strain gage is a device when subjected to pressure or force undergoes change in its resistance. Explanation: Except tester the remaining blocks form the input, intermediate and output stage of instrumentation system. Explanation: Transmission lines are the connecting line between the blocks and permits signal transfer from unit to unit. Explanation: The length of the transmission lines depends primarily on the physical quantities being monitored and on system requirement. 5. Why output of transducer is not directly connected to indicator or display? Explanation: Many transducers do not produce output with sufficient strength to permit there use directly. Therefore, the low level output signal of transducer need to be amplified. 6. What are the features of instrumentation amplifier? Explanation: Instrumentation amplifiers are intended for precise low level signal amplification because of the features mentioned. 7. What is the disadvantage of using LH0036 instrumentation op-amp? Explanation: LH0036 is a very precise special purpose circuit in which most electrical parameters are minimized and performance is optimized. So, it is relatively expensive. Explanation: The major function of instrumentation amplifier is to amplify the low level output signal of the transducer, so that it can drive the output stages. Explanation: When the requirement for the application are not too strict. The general purpose op-amp can be employed in the differential mode. Such amplifiers are called as Differential instrumentation amplifier. Explanation: A resistive transducer is used to measure the change in same physical energy, which is connected to one arm of the bridge.